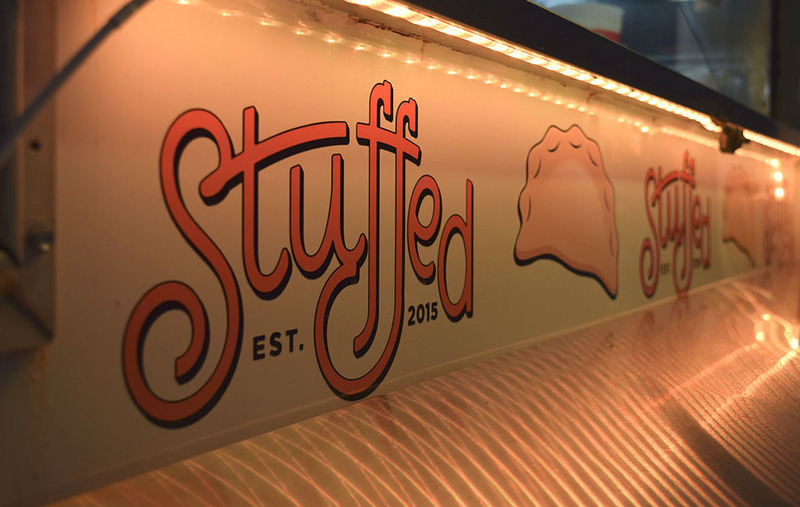 Michael Marten, an Art Director at Flip Eleven Web Marketing and Design reached out to me to help with a couple logo design options for Stuffed, a new food truck start up in Milwaukee, Wisconsin. They wanted a logo that was fun, modern, illustrated, and they wanted to have it incorporate a pierogi, which is a delicious Polish dumpling! Here are the two directions I provide. We decided to move forward with the top option. Color was introduced, and I explored an alternate pierogi illustration that looks more "plump". The final approved logo shown above is a combination of custom drawn lettering and a custom illustrated pierogi. The lettering is handled in single-weight san-serif that has some elements of hand-writing implied. The lettering is the color red to reference the Polish flag, and a black outline and drop-shadow is added to imply depth and improve contrast against a light background. "When I was approached to create an identity for a blossoming business Ray was the obvious design solution. His initial concepts were adored by the client and he promptly revised their chosen direction after some feedback, however, had the client been more difficult I am supremely confident Ray would have continued to work until they were pleased because that is just the type of guy Ray is."